This article is a short summary of Pokémon Platinum Version. 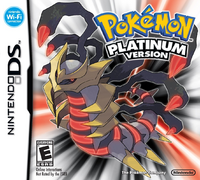 Pokémon Platinum Version is a Generation IV Pokémon game for the Nintendo DS. ...a world where time and space are altered! Catch, train, and battle your favorite Pokémon, and discover ancient, mythical Pokémon in this exciting new adventure!" This page was last edited on 4 November 2018, at 16:06.